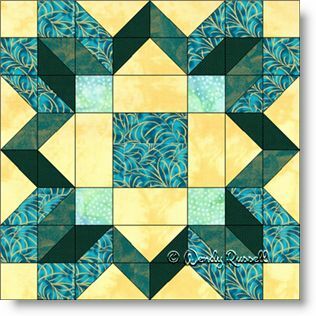 Let's look at this quilt block as an intermediate level of difficulty -- simply because there are quite a lot of pieces to work with. The good news is that you can make this as a larger block -- hence fewer blocks to make -- so that your quilt will go together faster. Other than squares and rectangles, the only patches in the block are half square triangles and flying geese units. Both of these patches are among the first ones you learn as a beginner quilter, so this just goes to show that making a quilt block is not difficult. Both of the sample quilts illustrated feature the blocks set on point, but they look entirely different. Your imagination will come up with a unique quilt all your own. Let's get started!